I stumbled onto this wonderful little restaurant completely by accident. I was walking doing the street minding my own business when I noticed their sign flapping in the breeze. I curiously poked my head in the gate only to be beckoned inside by a friendly staff member. I was hungry and in need of caffeine so I decided to give this mysterious new place a try and that’s probably one of the best lunch decisions I’ve might in awhile! And I make a lot of lunch decisions, you see. ViaVia is located in a unique building with wooden ceilings, a mezzanine, and a great outdoor space. Apparently the building was once a kitfo (raw meat) place and took a lot of work to get the space up to scratch. But they managed that and more! It really does have a lovely, welcoming atmosphere and the friendly owner and staff really make you feel at home. On that first visit I had ‘Thai Green Fish Curry’ which, while definitely nothing like any Thai green curry I’ve seen before (and I’ve seen a lot), it was tasty nonetheless. 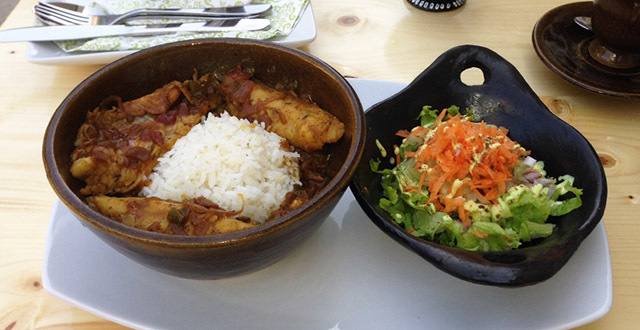 Three pretty big pieces of fish served with rice with a nice sauce over top and a yummy side salad all for around 90 birr. I sat outside on their patio with my book, enjoyed a coffee, used their free wifi on my phone for a bit, and left a very happy customer, determined to return. And return, I did! Five times in about two weeks! I work online so when I find a nice space to hide away with my computer that has lots of space, good tables, a friendly vibe, good food, and wifi, I’m going to be back again and again. 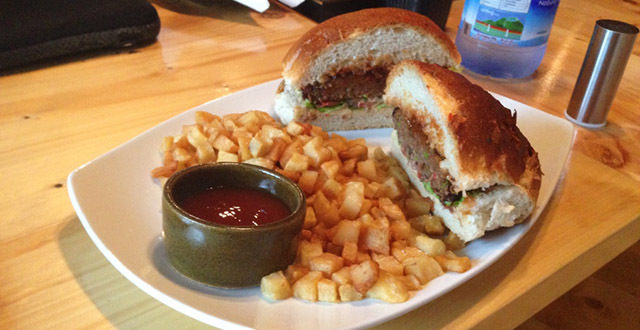 I’ve also tried the ViaVia burger (90 birr, I think) which was really good. It comes with all of the fixings and the bread is really tasty. It’s served with potato cubes which, while super yummy, are sort of small which makes eating them with a fork a bit challenging. More than a few went for a swim in my pot of ketchup. Fortunately I love me some ketchup. Being relatively inexperienced in ordering Ethiopian food, I’ve always felt a bit intimidated by the local places. 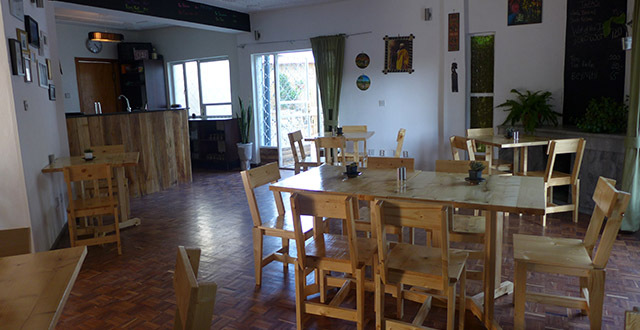 ViaVia has a few Ethiopian dishes on offer and it was great to be in a place where I felt comfortable asking questions. I finally figured out that the name of my favourite dish is ‘Doro Wat’ (120 birr) and I had it twice at ViaVia and was happy with it both times. 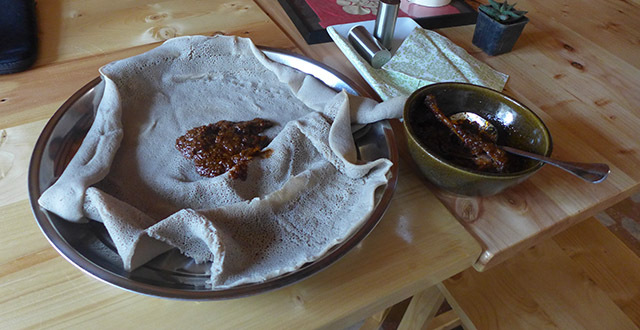 The serving is very big and there’s always an offer of more injera, though I had plenty to start with. 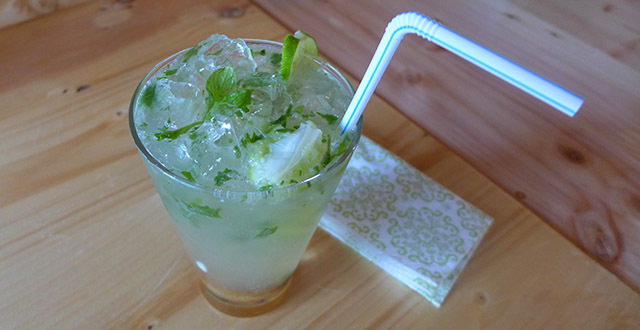 I also sampled their mojito (90 birr) and was very impressed! All of the minty, limey goodness that one would come to expect. Having had more than my fair share of horrible mojitos during my travels, I always expect the worst but I was very pleasantly surprised. ViaVia have a nice little cocktail menu and I also tried their Jamaican Breeze (60 birr, I think) which is white rum with fruit juice and fresh ginger and it definitely a winner in my books! ViaVia have quite a mix of music playing – from Michael Jackson to Johnny Cash to Guns and Roses to Florence and the Machine – in my books, all good. I found myself toe-tapping and singing along from time to time. They tend to crank the music pretty loud, though, so if you’re sitting inside you might feel a bit overwhelmed. They did once ask if the music was too loud (I think I was the only person in the place) and turned it down just a bit which was nice. ViaVia is part of a worldwide global network with each of the restaurants owned and run by Belgians, except for this one which is run by a Dutch lady. The network spans some really great locations from Senegal to Kathmandu along with several locations in Belgium. The menu changes monthly and they’ve had a couple of different desserts on offer so far. The menu is interesting, the service is super friendly, the cocktails are tasty, and overall this is a really great little spot for a coffee, a boozy beverage, or a whole meal. 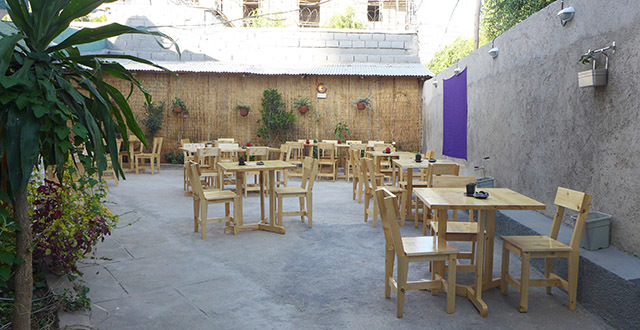 Check out ViaVia Cafe and let us all know what you think in the comments below!